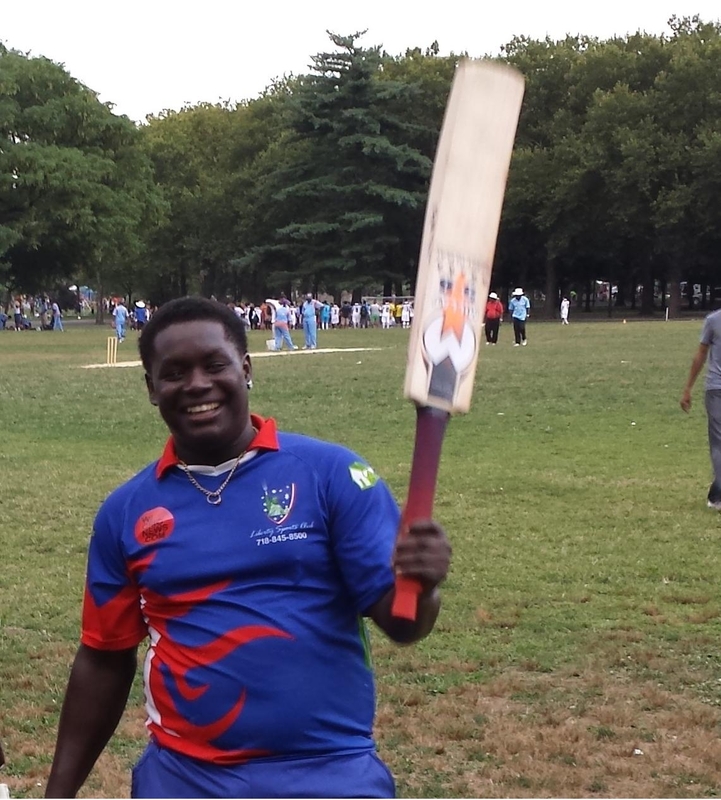 Terrence Madramootoo turned in a majestic batting performance to power Liberty Sports Club past Big Apple Cricket Club in their EACA Cricket Zone 40-Over clash on Sunday at the Baisley Cage. The devastating right-hander hammered an unbeaten 137 off just 73 balls to lead #TheBlueNation in an otherwise daunting chase of 293. On his way the Blue Hulk, as he is referred to by his teammates, scored his maiden century for LSC and shattered numerous club records in the 4 wicket victory. There was a fair amount of hype leading up to the match. During the first round of EACA Division 1 matches the two teams clashed Bay Park. A location which many of the local cricket fans in Queens find too far to travel out to. BACC won that match, successfully defending 221 to hand LSC their only loss of the season. With the news that the second round match up will be played at the Cage – what can be called the home ground of the EACA – fans turned out in their numbers to witness the match-up. The game would not disappoint, on the day fans were treated with 590 plus runs which included two brilliant centuries, three half centuries and a thrilling run chase. The day started with Telston Johnson winning the coin flip for hosts BACC. Without hesitation Johnson declared his preference to bat. Prominent Guyanese youth player Dominique Rikki and national player Richard Ramdeen strode out to open up BACC’s account. The pair raced to 50 in eight overs before Leon Mohabir proved to have the golden arm. His first ball of the day claiming Ramdeen. Rikki got off to a quick start and hinted early that he was here to score runs. Ramdeen had only scored 14 of the 50 when he departed. Skipper Zaheer Saffie strolled out to the middle and staged one of the crucial partnerships in the game. The captain and his crafty opener cautiously navigated their team through the middle overs adding 113 runs. Leon Mohabir would once again scalp a crucial wicket to remove Saffie. The skipper by then had already brought up his half century, striking four fours and two sixes in his 67 run a ball stay at the crease. Rikki had also cruised past his half century at this stage. With 10.3 overs to go and the game still in a balance BACC promoted their finisher, Donwell Hector, up the order to push the scoring along. The plan worked like a charm. Hector clobbered six boundaries and four maximums in his firework filled 63 of just 26 balls. One trip too many down the wicket, however, to have yet another hoick at the bowling resulted in Hector being stumped. Before the Hector fireworks, Rikki was the center of attention, the young batsman turned up the intensity to get past his century. His inning ended with him on 113 having struck 14 fours and one six. Clain Williams (10), Trevis Ross (13*) and Amarnauth Persaud (0*) were the other batsmen who took guard in the innings. When the dust settled after the first half of the game BACC had posted 292 for 5 in their 40 overs. Leon Mohabir was the pick of the LSC bowlers with 2 for 47, Andre Kirton 2 for 54 and Terrence Madramootoo 1 for 47 were the other wicket takers. May 8th, 2011 Liberty Sports Club was into it’s second year of competing in the EACA when they chased 238 against Bay Shore Tigers. The following year LSC did slightly better when 239 was successfully chased against Camelot Cricket Club. Those were the highest successful run chase by LSC. To get past BACC the boys in blue would have to trump those efforts… and then some. Francis Mendonca got things going on a positive note, two boundaries in the first four balls and things looked promising. Memories would have still been fresh of Mendonca’s game winning 86 not out about a year ago when LSC defeated BACC at the same location. Going to make it three in the over Mendonca held out as BACC celebrated his wicket. Trevor Henry, LSC’s leading run scorer, joined Romeno Deane at the crease and the duo got to work. Taking the attack to the BACC bowling Henry and Deane raced LSC to the first 50 in the chase off just 5.2 overs. Deane was on 20 when he was called through for a quick single and was found short of his ground by a Zaheer Saffie direct hit. Trevor Henry continued his assault on the bowling attack. Henry passed his fifty with a booming drive through the covers for four. Looking to press on in his inning, Henry skied one to cover where Clain Willimas hung on to a blinder. Henry fell on 59 having struck 9 fours and three sixes. Skipper Danesh Deonarain and Trinson Carmicahel briefly tried to consolidate before Carmichael was unluckily bowled for 5. Madramootoo joined his captain at the crease walking in with the look of purpose in his eyes. Deonarain and Madramootoo shared a crucial 58 runs partnership before Deonarain lost his wicket for 28 with the score on 158 at the end of the 23rd over. Needing to score another 135 runs to win off the final 17 overs Madramootoo, a former Guyana Defense Force player, arrested the game from the opposition. The stocky built right-hander smashed three fours and 3 towering sixes before hitting his fourth maximum to bring up his half century. Sharing another crucial 53 runs partnership with Dilly Khilawan, the LSC chase was moving along towards the target. Two ball after bringing up his fifty Madramootoo completed a hat trick of sixes to take 20 off the 26th over. Two fours and three maximums later the Blue Hulk blasted yet another boundary over extra cover as fans around the park erupted in celebration of Madramootoo’s hundred. The century is Madramootoo’s first for LSC and will now sit as the record highest second innings individual score. Achieving his personal milestone, Madramootoo did not get distracted, he kept focused at the team’s target. Partnered by Andre Kirton the duo saw home #TheBlueNation past the additional 82 runs needed after the sixth wicket fell. Madramootoo stayed true to his hard hitting ways smashing an additional two fours and three sixes. Fittingly Madramootoo’s final maximum sealed the victory with 3.3 overs to spare as the Liberty Sports Club camp erupted in jubilation and capping a record chase for #TheBlueNation. Kirton finished unbeaten on 18. Bowling for BACC Saffie finished with 2 for 49 while Mark Gomes and Rikki picked up one wicket each. The win keeps #TheBlueNation in first place in the Cricket Zone 40-Over EACA Tournament with a 11 – 1 record and two games left before the playoffs. LSC will travel to Belmont State Park to host the resurgent Atlantis CC-NY for their 13th game this season. BACC will be again at the Cage taking on hosts Richmond Hill CC. This entry was posted in Baisley Pond "Cage", Eastern American Cricket Association, Headlines and tagged Dominic Rikki, Donwell Hector, Terrence Madramootoo, Trevor Henry, Zaheer Saffie. Bookmark the permalink.